My eleven year old son loves collecting sports cards and other sports memorabilia. As far as sports cards are concerned his dad has taught him to be very organized and know what's what. The boy and his dad buy the packs and sports boxes and open packs quite often, do card trading and stuff like that with each other to work on their sets and can sit at the table and work on them for quite some time. Such a good father and son moment to learn to work together and spend quality time together and teamwork, among other things. So my son is working on his card pack and he finds the special gridiron giveaway code card which is inserted in one out of every six packs of 2010 Topps football. On that card is a special code and you are supposed to go to their website and plug in the special code and then click "Unlock Your Card" to see what you've won. Now it states on the website these are one of a kind originals and not reprints and that "We've bought back the original cards", from where who knows. It also states the cards are not guaranteed to be in "Pristine Condition". So the boy gets his special card and goes to the website and plugs in his code, I guess you can also use other code cards you have and do them all at once. Sounds like a good idea, we tell people that buy from us, we combine shipping items to save them money. We can send multiples items for a much cheaper shipping cost than shipping them one at a time, so we do that to help our customers with shipping costs. What was unbelievable from a parental stand point from someone who has bought and paid for shipping and watched my husband ship many things over the years the shipping was incredible. 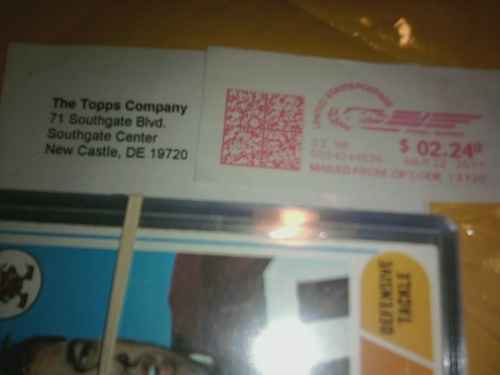 It was by the United States Postal Service, so we know very well how much it would cost to ship football trading cards. The total cards my son was getting was I believe 17, total weight, um next to nothing. I think my husband has shipped "Hardcover books" for cheaper than what they wanted for just the first card. It was over a few dollars to ship the first card and I think .54 or so cents for each additional card. Are you kidding me. I don't remember the exact total they paid to have the cards shipped but I believe it was in the area of $11.00. I told my husband that it was such a major rip off, and he agreed but we knew our son would be very disappointed so my husband along with my son did the order. Well today the order came in the mail, in a mailer envelope and it cost them a GRAND TOTAL of $2.24 to ship it out, so I guess he over paid just a tad for shipping. He waited all day for his dad to get home from work before he'd open it and look at his cards. Well to tell you the truth I think the cards were alright. Some were not pristine, I saw some corner creases, some worn out corners, and some worn out edges as well. Then he showed me the back of a card, it was a checklist card, it was marked it pen all over on the back. I think he has his dads standards for collecting. Thank goodness he wasn't worried about whether or not the card was centered well during manufacturing, which is another thing that is taken into account on sports card grading. So anyways, he was a little bit disappointed in the cards, and I was shocked at the shipping. Although from what I saw and see now looking at the website, they didn't represent anything, they didn't guarantee the condition of the cards, and the shipping was explained, although I think it was way over priced. My husband says next time they can just go to a card shop and shop around there where you can see what you are getting, you aren't paying shipping and there is always the opportunity to haggle just a little bit, which always adds to the fun.